A device called a SkyCaddie was introduced roughly ten years ago. It was the first electronic device to combine a GPS with maps of golf courses. Over the ten years, roughly ten models were introduced that would alter the size and functionality, eventually integrating voice and color maps. It was a simple concept. Based upon your location on the globe and the pin, the SkyCaddie would tell you how far you were from the hole. Personally, I had no use for these since I was such a bad golfer that the distance to the pin was meaningless. However based upon the sales of the device, there are a lot of golfers that needed this information. Eventually other companies came out these devices including Garmin, Callaway and several others. Then came along the iPhone. With its integrated GPS capability and ability to download apps and maps, it revolutionized this space almost overnight. The irony is that the leading makers of golf apps are backed by the same companies that made those golf GPS units over the past ten years. These applications will run on the iPhone, iPad Mini and full size iPhone. I can see using the iPhone on the golf course. It’s the right size plus you likely have your phone with you anyway. The iPad and iPad Mini seem too large to use. Not too sure where you could put it with it getting in the way. We always say it’s tough to swing a golf club with anything hanging off your belt, so consider a mounting alternative to the belt mount. To select a mount for golf, consider where you would like to put it. If you are walking and carrying clubs, you can slip it over the golf bag using any solid sun visor mount and expandable cradle. Be sure it’s a high quality cradle and keep your eye on the phone to make sure it doesn’t slip off. If using a manual push cart, there are a lot of solutions to place it over the round tube near the handle. 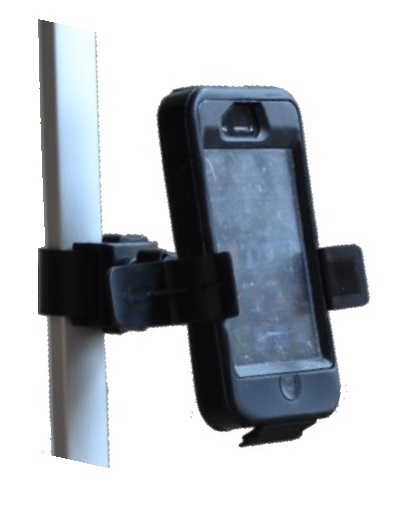 Use any strap mount to keep your iPhone at a convenient location. And here’s a little secret for those owning a Sun Mountain cart: the umbrella hole that is part of the cart is the same screw pattern as a camera tripod so buy a mount that uses a tripod screw. Hopefully you are fortunate enough to driving an electric cart. I love these things. Have been to a few private courses where they start you out by outfitting your cart with snacks and beverages. As if that’s not enough, they have a beer cart that drives around the golf course to load you up with more snacks in case you ran out of the first batch they gave you. I write a blog about mounts, I’m not a very sophisticated guy. It takes very little to impress me. Anyway, these carts have more cup holders than my SUV, and like I said, there’s a beer girl to replenish the frosty beverages so you don’t need to use all the cup holders. Use one of them to hold your iPhone using a cup holder mount. Use the same ones as you would use in a car. We wrote an article about cup holder mounts which you can review here. If there aren’t any free cup holders, consider a suction cup mount that can attach to anything smooth and flat.